Cold conditions now in place. Creeks and sloughs freeze up nicely with this deep weather impact on race trail conditions is great. AMMC does not for any reason conduct racing without absolute 100% safe race conditions for all competitors. Cross country and 120’s racing at the Willow Winter Carnival will be fantastic !! 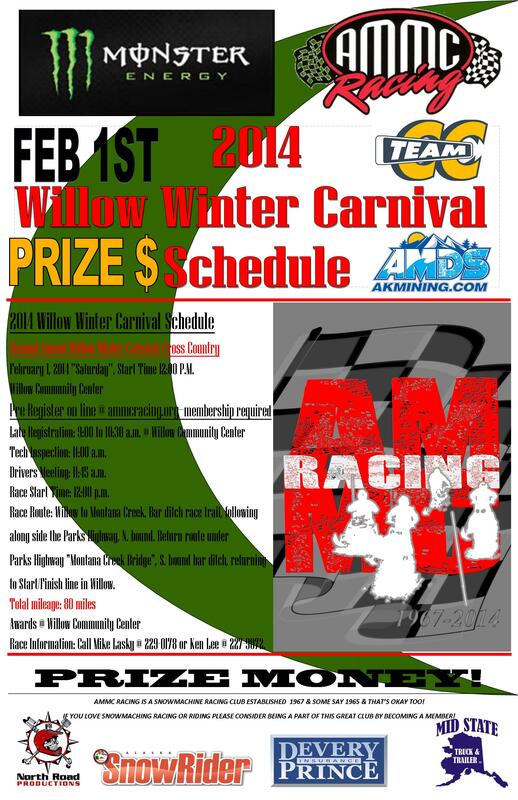 Please all racers come out and experience the spirit of the Willow Winter Carnival. Remember Kid’s 120 race too. Come on out and join us at the Willow Community Center. Race registration 9:00 to 10:30. Awards to follow at Willow Community Center. This event was alot of fun last year, lets make it even better this year.